“Whatever you face, I’ll help you.” Aviva took both of her hands and lifted them to her mouth. She kissed each set of knuckles sweetly, then led Shulamit over to the food. Being queen can be stressful, but it helps to have a supportive partner who’s also a professional chef. Read about their latest adventures in Climbing the Date Palm, the sequel to The Second Mango. Queen Shulamit is eager to help Kaveh, the youngest prince of a neighboring country, when his father throws his engineer boyfriend in jail for leading his workers in protest over underpaid wages. But if she can’t find a peaceful solution that will keep everybody happy, the two countries could wind up at war. Paperback from feminist bookstore • Paperback from Amazon. Art by Rebecca Schauer on commission. 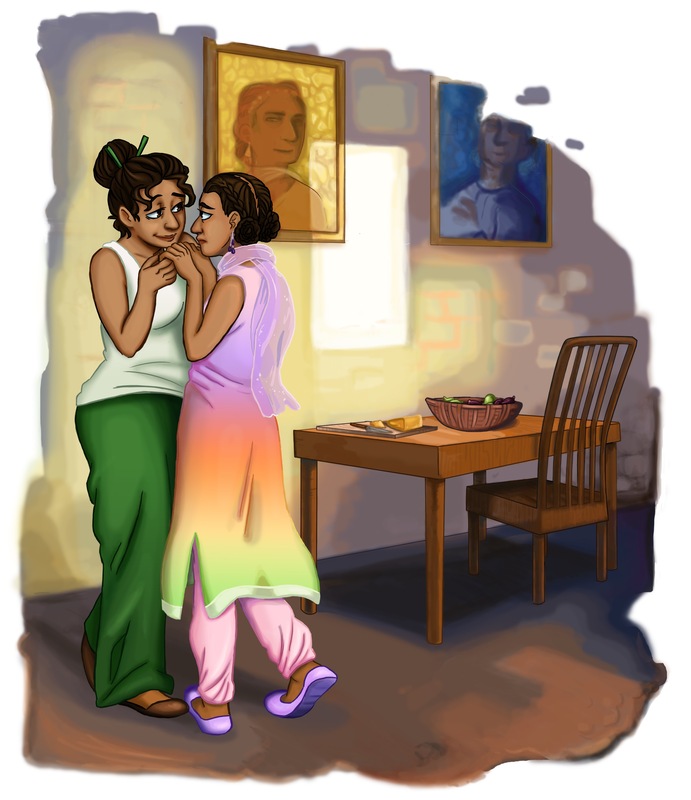 Image | This entry was posted in Mangoverse and tagged bisexual, Bisexuality, fairy tales, fantasy, femslash, glbt, lesbian, lesbian books, lgbt, lgbt fantasy, lgbtq, queer, qwoc, women-of-color, young adult, young adult fiction. Bookmark the permalink.